By the time I’d started watching my screener for season five’s penultimate episode, “White Whale,” Brooklyn Nine-Nine had officially been canceled. So I wasn’t exactly in the best state of mind to watch the episode; even if it were an all-time classic episode of Brooklyn Nine-NIne, that would just be a reminder that FOX canceled the show and nothing about its quality would change that. I even admitted on social media that I started watching the cold open and wound up tearing up as a result. I’ve written a few times how certain things about this season feel like farewell season behavior, and if not intentional, then they could at least work in retrospect as a goodbye to Brooklyn Nine-Nine and as reminders of what this show is all about. “The Box” encapsulated this, especially in terms of the journey of the series. And building the entire thing to the Jake/Amy wedding, as well as Holt’s potential Commissioner position, highlights it overall. By the time I finished “White Whale”—as I had to step away from the episode after the initial cancellation blow hit—NBC had saved the series, picking it up for a 13-episode sixth season. But in watching the episode, I still had that feeling that this season was made with the assumption that it would be the last one. So even if we don’t know what the show’s fate will actually be once it airs on NBC, it’s worth acknowledging and appreciating that Brooklyn Nine-Nine created a season that could successfully function as The End. But I’m really happy it’s not actually The End. So, on that checklist of things to get out of the way before the show ends this phase of its life, we’ve got a classic Amy/Rosa (aka the Sleuth Sisters, which Boyle surprisingly didn’t come up with) team-up. While the show just recently gave us an Amy/Rosa plot in “NutriBoom,” that was more about Amy’s new job and Rosa being the supportive friend. Here, it’s all about the partnership and how that partnership is a badass one on the professional and friendship level. To the point where Amy learns even more about Rosa’s mysterious—and Lola Spratt-level impressive—backstory with some classic casual Rosa reveals. The plot does end up being another showcase for Melissa Fumero though, first as Amy tries to prove her coolness in the form of being loved by the elderly, then as she tries to win Rosa back... by jumping off a building. And I can’t forget the way Amy is so annoyed by both Nurse Ezra and Eunice, as she makes things very clear throughout this whole event that this is all about the Sleuth Sisters. As Rosa says during a frustrating point in the case, nothing has changed in the seven years since she and Amy last lost their “white whale,” Sergio Mindar. Except, as they eventually acknowledge here, things have changed in terms of Amy and Rosa’s close friendship and the fact that Amy would dislocate her knee in order to fix things between the two of them. The Amy/Rosa plot is the one at the most consistent level of quality and humor throughout the episode, while the other two plots have some minor issues that slow them down—or at least highlight how they’re not quite at the Sleuth Sisters level. For example, the Jake/Terry plot is only able to exist in the first place because Amy Santiago apparently left a large amount of wedding tasks undone until the very last minute. The plot is still funny, but its existence as the result of apparent Amy procrastination is suspect... especially when there are binders upon binders in this situation. Despite this un-Amy-like behavior, the concept of Jake being put in charge of the wedding’s finishing touches surprisingly doesn’t create the recipe for disaster one would expect. While the Amy/Rosa team-up is a matter of unfinished business, the Jake/Terry one is all about Jake looking to Terry as the model husband with all the answers. And he’s right, just like he’s right to let Terry know he’s “large and in charge, like El DeBarge.” But a great deal of why this plot works is because it doesn’t hit the cliche beat of a guy being unable to properly work with wedding planning. In fact, all of Jake’s problems here are more about a feeling on inadequacy than a feeling that it’s chick stuff. It’s not a matter of Jake not being able to do things because he’s not Amy/the bride (though his groom gut is a woman, which Terry thinks is “really cool”), it’s a matter of Jake thinking he’s not able to do things (whether it be the tasks themselves or getting things under budget) because he’s not good enough to be Amy’s husband. I’m torn though, between liking the keys getting locked in the car because it presents the idea of how all it really took was one little failure (after multiple successes) for Jake’s anxiety to kick in or disliking it because it’s honestly as sitcommy as keys getting locked in the car. And in the case of the latter, I wondered if it was really possible that none of them (or anyone else at the precinct) had a slim jim or at least an alternative way to get into the car. On the other hand, I still very much laughed when Jake threw a rock at the car window, as that was my second thought about the situation. Terry just wanted to see a movie for grown-ups—with “tons of cuss words”—and instead he ends up getting his car windows smashed. This week’s Holt plot ends the brief Olivia Crawford feud, and while it’s a relatively small story in this entire Commissioner arc, it does highlight the importance of a relationship dynamic like this. Unlike the Holt/Wuntch dynamic (which I admittedly miss), this story allows for actual growth. It’s a professionally competitive relationship, and it’s not the genuine antagonism that Holt/Wuntch had for each other, no matter how many times Crawford calls Holt out for being old. (And in her defense, he does say “huckster’s crutch.”) That’s important because it allows Brooklyn Nine-Nine to focus on making the audience root specifically for Holt becoming Commissioner, not the more short-sighted goal of them rooting for Holt to crush Crawford (which was the way things often felt with Wuntch). It also allows for a new story of someone respecting Holt as a father or grandfather-like figure, which is always appreciated. But the difference between the Holt/Wuntch relationship and the Holt/Crawford relationship is why the whisper campaign aspect of the plot doesn’t get off the ground. It’s intentional—especially as a point that there’s nothing else they can do to beat Crawford—but even just for its little amount of screentime, the bit doesn’t work that well and is the weakest part of the episode. During the whisper campaign stuff, the brain trust of Gina and Boyle come up with such ideas as: She lied on her resume, shoplifted, planted evidence, seduced a priest, pads her stats, day drinks, and doesn’t like Boyle. That last one is sad and true, apparently. Oh, and “she’s sort of stinky,” Gina heard. Holt definitely doesn’t have the best options here, but once the episode gets past that—as much as it makes clear it’s literally all Gina and Boyle want to do—the rest of the story comes with a nice bit of sentimentality at a time when the need for this show and its brand sentimentality is more apparent than ever. Plus, Holt gets Gina good by pointing out she writes fan mail to herself. This week’s plots all come from a place of uncertainty for the characters in one way or another, which could have been really stressful had Brooklyn Nine-Nine stayed canceled. Rosa’s uncertain about her abilities as a cop, especially with the one that got away. Jake’s uncertain about his ability to do the one thing Amy has asked of him, which really boils down to an uncertainty when it comes to being a husband. Holt is uncertain about his fate in this race for Commissioner, which is what causes him to consider Gina/Boyle’s whisper campaign idea in the first place and then to (temporarily) drop out of the race. 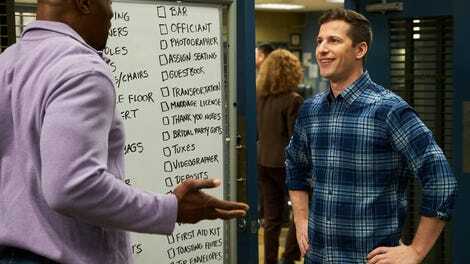 While “White Whale” may not have the same Very Special Episode vibes of “Show Me Going,” it’s still important in its own way, highlighting the (very funny) support system that is the Nine-Nine. While Gina and Boyle aren’t all that helpful with their whisper campaign idea—which is honestly their only idea—the point is still that they’re very concerned with helping at all. Even Scully and Hitchcock, while they were bribed to help—and really, it was more like fuel than a bribe—they still helped where they could. “White Whale” being the first episode to air after Brooklyn Nine-Nine’s brush with death feels necessary., as it highlights the strength of these characters when they work together Now we just have to see how it all ends... for the season. Hitchcock’s cold open monologue about anti-cop bias got me thinking about the terrible takes I saw on Twitter immediately post-cancellation (from people who don’t watch), about how Brooklyn Nine-Nine is just police propaganda. Jake: “Yeah they are.” Okay, these two are perfect for each other. Rosa: “Who do you think was riding the jellybean I was chasing?” Aww, Rosa shares her dreams with Jake. But also, Rosa is a person who shares her dreams. Rosa: “What is that? That’s not a widely-used term.” Also, Rosa’s face at Amy saying it’s “time for some senior seduction” is priceless. Amy: “I had an epiphany, I got real excited, I moved my knee, and now I hurt, uh real bad.” Like I said, Melissa Fumero is on fire in this episode, and this moment in particular is delightful. I get it, if I grew up with a chambermaid, I would probably mention that all the time too. But Eunice needed to learn to read the room.